Copper alloy, cast, incised (i.e. engraved or chased) and inlaid with silver wire. It may also have been inlaid with a black material, which has been lost. This pot-bellied jug is a type of drinking vessel. It was popular in Iran and other parts of the Middle East in the later Middle Ages. A typical example had a globular body resting on a foot ring, a wide, cylindrical neck and a dragon-shaped handle. 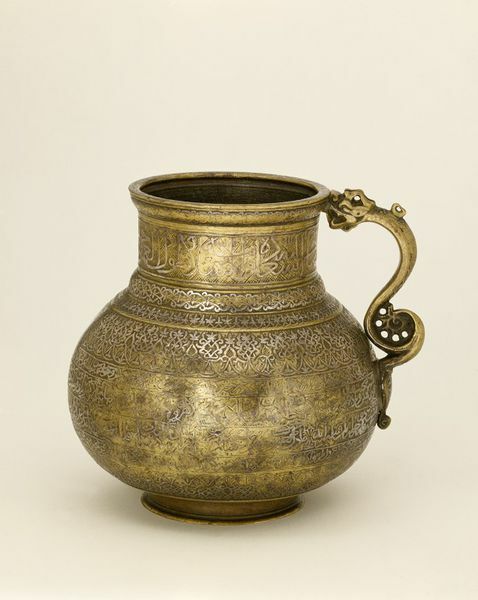 Examples made in luxury materials such as silver gilt and jade show that these types of vessels were used in courtly circles. This example belongs to a less spectacular but equally interesting group. They are made of brass, with all-over decoration of horizontal bands. Much of the work is in silver inlay. The bands are filled with texts in Arabic and Persian, and small repeating patterns not unlike those found in manuscript decoration of the time. The Arabic texts are on the neck, the base and under the foot ring. They contain blessings for the owner, such as 'May its owner enjoy happiness, peace and long life so long as the turtle-dove coos ...'. The Persian inscriptions are on the body. They consist of two lyrics by the poet Hafiz of Shiraz, who lived in the 14th century. These lyrics contain references to the drinking of wine, such as 'What combination is more pleasant than a feast, good company, a garden and springtime? Where is the boy to serve the drink? Tell me, why are we waiting? ...'. On the base there is a signature giving the date 866 in the Muslim calendar (866 began in October 1461). It also gives the name of the maker, Habiballah ibn (son of) 'Ali Baharjani, who signed several other similar pieces.